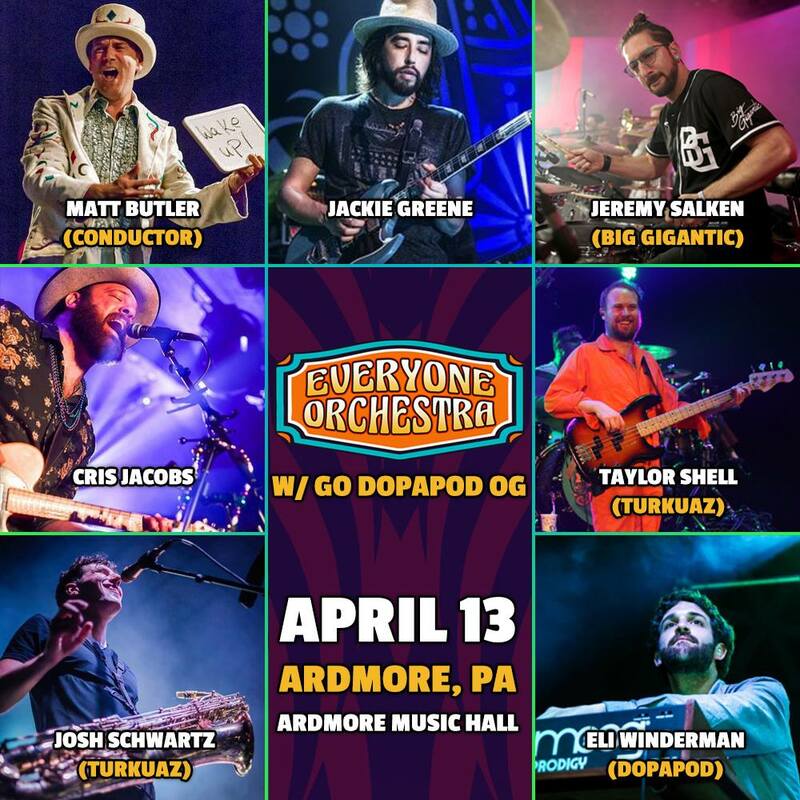 The Ardmore Music Hall welcomes back Matt Butler’s Everyone Orchestra for a night of exciting improvisation from some of the top names in live music plus a special opening set from Go Dopapod OG this Friday, April 13. Everyone Orchestra will feature guitarists Jackie Greene and Cris Jacobs, drummer Jeremy Salken of Big Gigantic, bassist Taylor Shell and saxophonist Josh Schwartz of Turkuaz, and keyboard wiz Eli Winderman of Dopapod, who will also perform with Go Dopapod OG. With the brilliant mind of maestro Matt Butler at the helm, pushing a rotating group of highly skilled musicians through spontaneous creations of progressive rock / straight funk / live EDM / Americana and sonic directions in between, it’s a can’t miss show that will quite literally never happen again. While the songs change, the one thing that remains is the spirit of creativity fostered through Everyone Orchestra and its unique take on what a concert experience can be: an interactive and crowd-engaging experience. Many Dopapod fans know them as a 4 piece rock band originating in a Boston at the Berklee College of Music on 2007. Only a few realize that they actually started as a duo with Eli Winderman on keys and Michelangelo Carubba on drums. After about a year or so they added Rob Compa on guitar and they toured as a trio for about a year after that, primarily around New England and Upstate NY. Many of the songs Dopapod fans know today actually originated during this time but in a slightly different instrumentation with Eli playing left hand bass. A decade after their inception, they will recreate this era of the band once again at the Ardmore Music Hall.